Maintaining your fire sprinkler could save lives! One of the most vital forms of fire safety, sprinkler systems are crucial in protecting businesses from fire. It is highly encouraged to install fire sprinkler systems in your business for a variety of reasons. 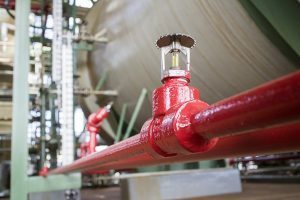 Based on NFPA guidelines, a business that has a fire sprinkler system installed increases the likelihood that injuries to human lives will be avoided. Commercial fire sprinkler systems are effective since they typically activate quickly. This allows them to easily and efficiently control the fire. The deadliest part of a fire are the toxic fumes that are produced. The smoke from a fire can quickly spread throughout a large business. Fire sprinkler systems have the ability to reduce how much smoke is produced from a fire. Uncontrollable fires canspread very rapidly. This accelerated speed of a fire is slowed down by the presence of a fire sprinkler system. Therefore, a properly maintained and installed fire sprinkler system can give people within your business the time necessary to get out in a safe manner. As business owners, it’s important to protect all the essentials that keep your company afloat. A commercial fire sprinkler system is able to curb the flames that spark during a fire. When flames do not rise too high, there is less chance that the structure will be demolished as a result. Fire sprinkler systems use the most minimal amounts of water necessary to turn potentially deadly flames into smaller ones. Most fire sprinkler systems are designed to only release water from pipes when temperatures rise, such as in a fire situation. The water is then released in a designated area around the fire source. This contains the amount of water released from the system, getting the fire out quickly so you can get your company back up and running as soon as possible. This entry was posted on Thursday, February 16th, 2017 at 1:44 pm. Both comments and pings are currently closed.